As usual, it seems like summer is flying by! It is a busy time of year with vacations, graduation parties, weddings, and making plans for the upcoming school year. And at work, covering for vacations and handling an influx of business can be daunting. But, Area Temps can help! We proactively recruit professional, skilled trades, industrial and clerical candidates for temp-to-perm, direct hire and seasonal employment. Bringing one of these qualified individuals into your organization, whether it is for a few days or for the rest of the summer, can reduce stress and increase the morale of overwhelmed employees. 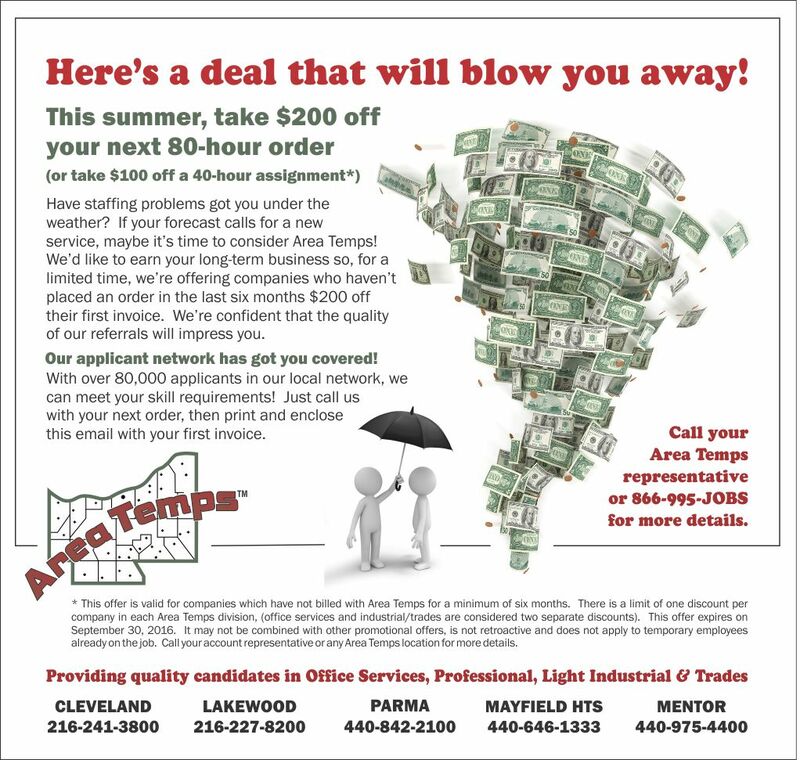 With our summer promotion, any customer who hasn’t billed with Area Temps for the past six months is eligible, and it’s a great opportunity to give us a try, with $200 off your first invoice! * Be sure to keep us in mind…the offer is valid until September 30th. As always, Area Temps is ready to support you with all your staffing needs. And, as part of our full-service commitment to you, we are continuously adding new HR-rich content to our media center. Be sure to check back often for our blogs, whitepapers, eNewsletters, magazines and other informative material. I hope you’ll let us know what you think of our media center and that you will share anything you find especially helpful with your own social network. For further assistance, please feel free to contact your account representative or the location nearest you. Meanwhile, enjoy the rest of your summer and we look forward to working with you in the coming months!